70% of the world’s food is produced by smallholder farmers, whose livelihoods are threatened by low yields, degraded natural resources and inefficient access to markets. Companies see their supply chains jeopardized both in terms of quality and quantity when sourcing from a great number of smallholder farmers. Governments must contend with degraded and less diverse ecosystems due to unsustainable agricultural practices (water pollution, deforestation, ecosystem degradation). 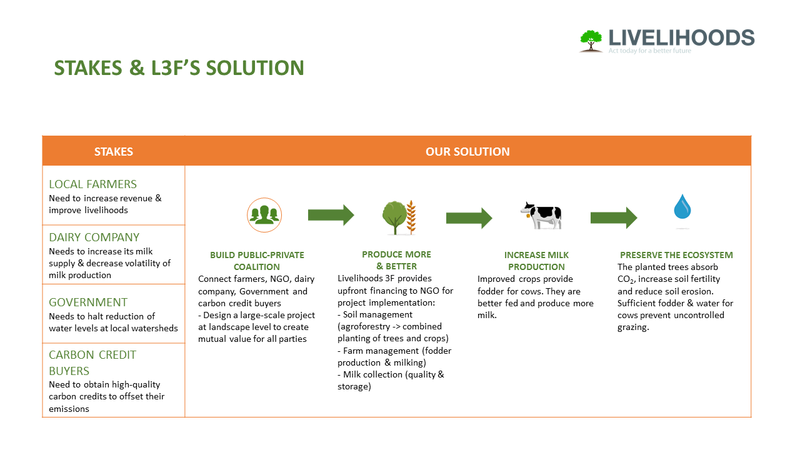 The Livelihoods Fund for Family Farming (L3F) proposes a new approach to supply chains in order to address all of these issues simultaneously. We invest in large-scale projects enabling farmers to produce greater yields of higher quality through sustainable agricultural practices. We strengthen the connection between groups of family farmers and business supply chains. Our investors commit to purchasing the commodities originating from these projects over a 10-year period. Our projects also create benefits for society as a whole through biodiversity preservation, water resources management, and CO2 sequestration. L3F receives results-based payments in order to guarantee tangible social, economic and environmental impacts. The Livelihoods Fund for Family Farming (L3F) was created in 2015 by Danone and Mars, and later joined by Firmenich and Veolia. 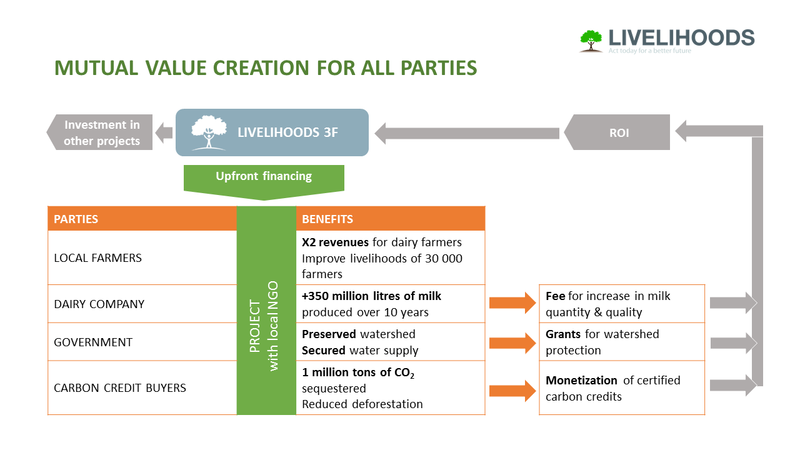 L3F targets raw materials which are mainly produced by smallholder farmers, and greatly impacted by environmental, social and supply issues—such as cocoa, palm oil, mint, vanilla, milk, sugar, carrageenan and water (mainly through watershed protection). Farmers and their communities receive free training, support and equipment to implement Sustainable Agricultural Land Management (SALM) practices in order to adapt to the impacts of climate change, reduce greenhouse gases, and increase farm productivity and food production. These practices require limited financial investment and have proven their effectiveness in improving agricultural productivity. Companies and private investors are able to test and roll out sustainable sourcing projects on a large scale. Our projects enable them to secure their supply chains, both in terms of quality and quantity, over the long term. Livelihood’s joint approach enables private companies to share risks and go to scale faster. Private sector actors may participate in the fund as investors and/or project off-takers, capitalizing on collective learnings and gaining access to likeminded partners. By contributing financially to the fund’s projects as an off-taker the public sector can help generate public goods including biodiversity preservation, water conservation, and CO2 sequestration. The public sector can therefore multiply the impact of its investment, while minimizing risks by sharing project costs in results-driven coalitions. Our role is not just to sell a bottle of water or a cup of yoghurt. It’s much more than that. We need to look after our ecosystem, and what is more important in our ecosystem than the farmer selling to us milk, fruits, coffee, chocolate and so forth? Franck Riboud Chairman of the Board of Directors, Danone. Chairman of the Board, Livelihoods Fund for Family Farming. Livelihoods 3F presents the opportunity to create real scale by engaging with others. Business has an important role to play in addressing environmental and societal challenges and by focusing on such long-term investments we believe we can contribute. By coming together with others, we have a significantly greater chance of success and an opportunity to have meaningful positive impact that will endure. Victoria B. MarsChairman of the Board, Mars, Inc.
Firmenich partners with smallholder farmers around the world to protect the best that nature can offer, while sharing its expertise to positively improve their livelihoods. Investing in L3F gives us the opportunity to scale up the impact of our responsible sourcing, building on the fund’s extensive network of likeminded NGOs and corporate partners. Gilbert GhostineChief Executive Officer, Firmenich. L3F offers Veolia the opportunity to support high impact and empowering projects, sponsored by a community of local and international stakeholders. Veolia will support L3F thanks to its worldwide know-how on water management and natural resources conservation and will have the opportunity to continue to work, through this coalition, on sustainable farming and watershed management challenges.